I saw someone on Instagram with a door mat that pretty much summed up my week! It simply states: "Please Hide Packages From Husband". Yes, I definitely need one of those at home, especially around this time of year! You see, all of the things that I ordered the week of Black Friday came flooding in at the same time! Despite that fact that most items in each package were scored for around $30, that didn't quite assuage the fears of my husband as he witnessed the heaping mountain of packages (I am exaggerating for dramatic effect...a little, anyway) that the UPS, FedEx, DHL, and USPS men left over the course of the last few days! A few of items that were left at my doorstep as of late include these goodies from J. 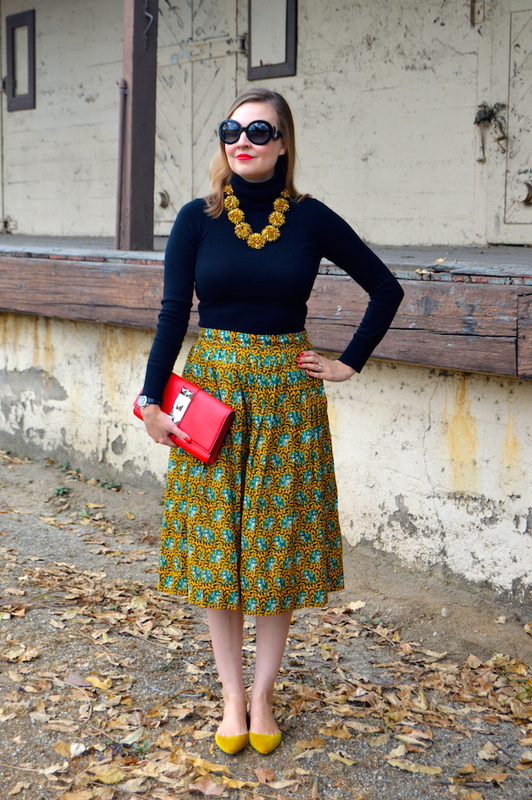 Crew, namely my elephant print skirt, pom pom necklace, and velvet slingbacks. Not only was everything I ordered only around that $30 price range that I just mentioned, but all of the individual pieces seemed to match just perfectly! I hadn't planned on that! So I decided to throw my Thanksgiving sale finds together into this one look. I think this just goes to show that good things can come not only in small packages, but also many packages, much to the chagrin of husbands everywhere! Great finds Katie! I feel exactly how you feel this week when all my supposed packages were to arrive! LOL I love your outfit color combo. Everything just fits together perfectly and though I don't wear any jewelry or accessories I have to say I am drawn to your necklace. It is so different from what I have seen and I kind of like it! I hope your morning is off to a great start! So cute! I love the shoes, skirt and necklace! I absolutely love this outfit! The necklace you chose pairs so nicely with your skirt, and I love that you chose a black shirt to tie it together. 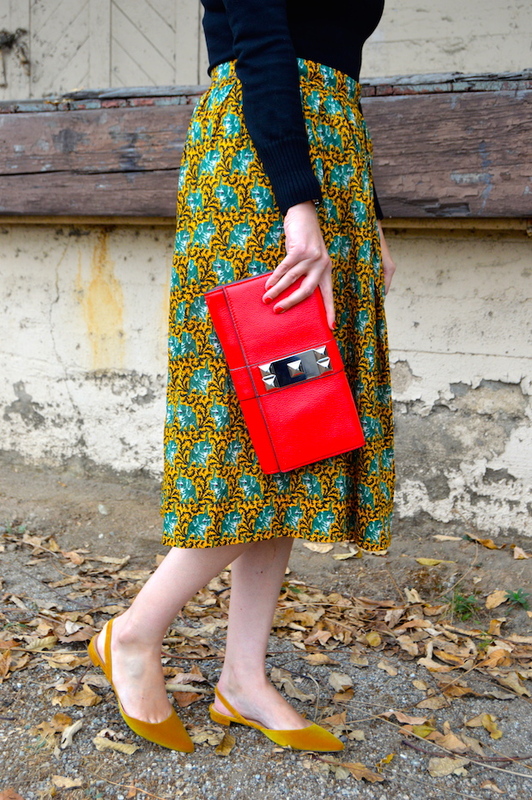 Plus, the pop of color from your clutch is so gorgeous. That necklace is absolutely beautiful! I love that it compliments the skirt and shoes perfectly! I love everything about this outfit! The necklace is so pretty and the red clutch contrasts perfectly. My husband makes me feel guilty every time a parcel arrives - I intercept the delivery person and hide the packages whenever I can! 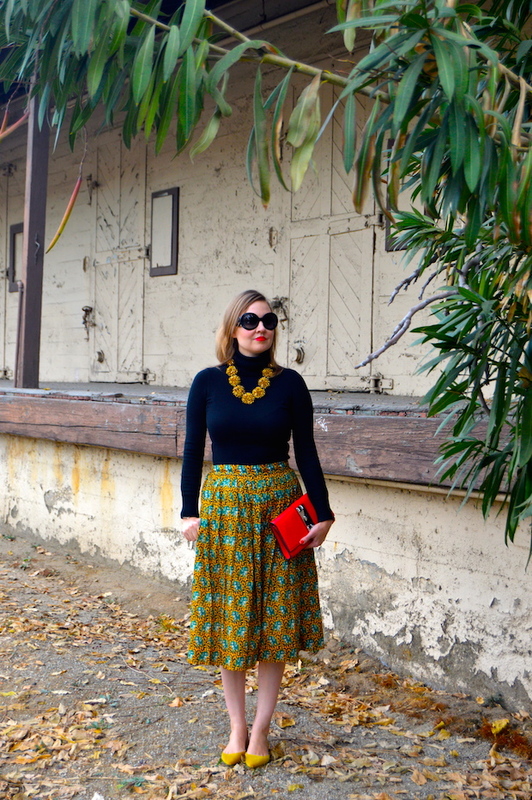 It's impossible to say what I love more - that skirt or the statement necklace! :) The red clutch is a nice little touch of colour too. All my Christmas presents (and a few things for me....) have been arriving over the past few days. Luckily hubby is used to it and doesn't bat an eyelid, haha! 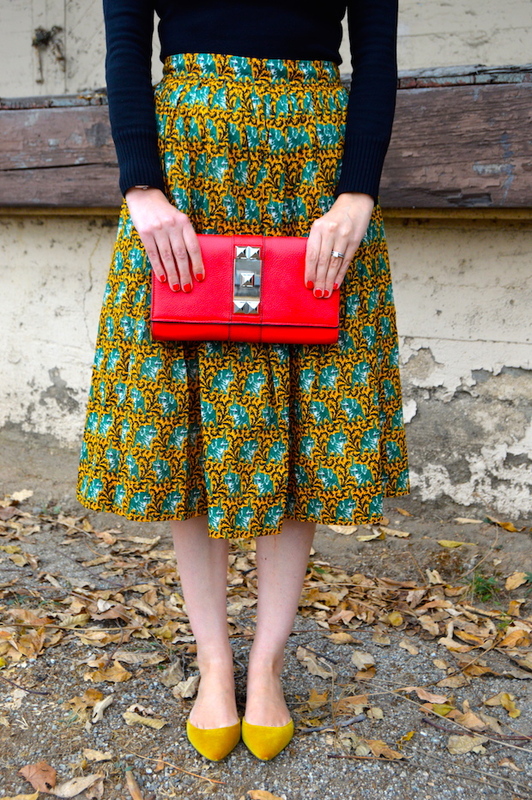 That skirt is awesome and the velvet mustard flats are even more awesome. What a great match. 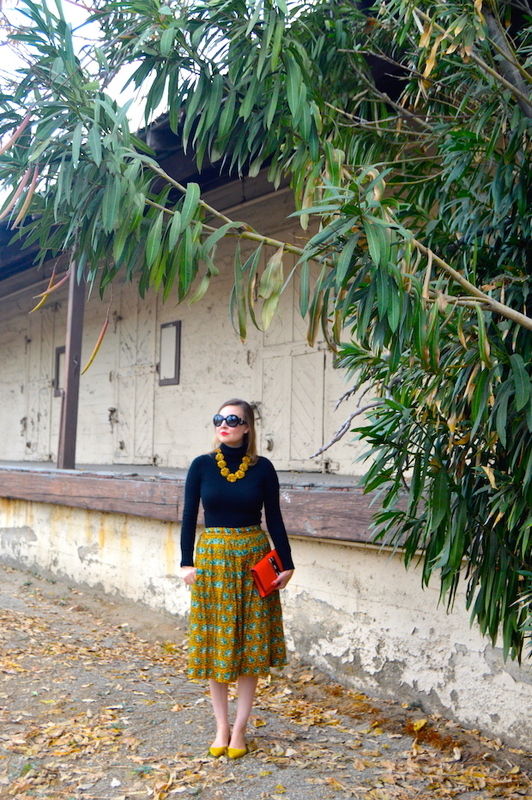 I too am wearing some mustard on the blog today, Katie. Cannot wait to see your latest goodies. Welcome by today and every Thursday to share your gorgeous style by linking up with me. Thank you and Happy New Year!